What to put in small shady space? 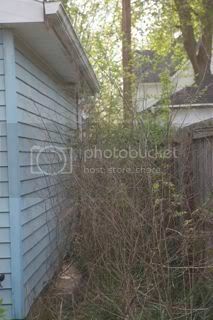 I have this area between my garage and my fence that needs cleared out. Is there anything that would thrive back there (besides the weeds which are doing a nice job) where it is mostly shady and a pretty tight squeeze? I don't really know if it gets any sun at all. It runs from east to west... the drainage is pretty decent there I guess. I'd say it's probably a 2-3 foot width and however long the garage is. *Wild ginger is also a low ground cover, a lot plainer, but it's a native and spreads very nicely without being invasive, gives a rich look. *Other ground covers include lamium, pulmonaria, caladium all with lots of variegated foliage. The lamium and pulmonaria are mostly white variegations, but white shows up very nicely in shade. Pulmonaria is native. The caladium comes in all kinds of fancy colors, reds, pinks, whites, but it is tender and has to be dug up every fall. *The classic shade plants are hostas, which come in blue-greens, yellow greens, and lots of variegations and a wide variety of sizes and are often fragrant. *If you can keep it moist enough you could put ferns in with the hostas. Lady fern is a very pretty native. *For flowers there's bleeding heart, epimedium, columbine. * One of my favorite shade plants, that I think is not used nearly enough in gardens is solomon seal. It grows slender stalks that arch over beautifully. The native one is a spring ephemeral that disappears pretty quickly. There's a hybrid version with white variegated leaves that lasts much longer in the garden and spreads quickly into colonies. Wonderful suggestions! I'm going to use some of them myself, because I'm removing a lot of Scilla from the north side of my house this year, and want something nicer there. The Scilla has just about taken over my entire yard! Amazingly invasive! Thank you for all the suggestions! I will look some of these up and let you know what I come up with.